The Challenge #1: Make Do & Mend – due Wed 15 Jan. Let’s start of the year with a clean slate, and with a bit of a tidy up. 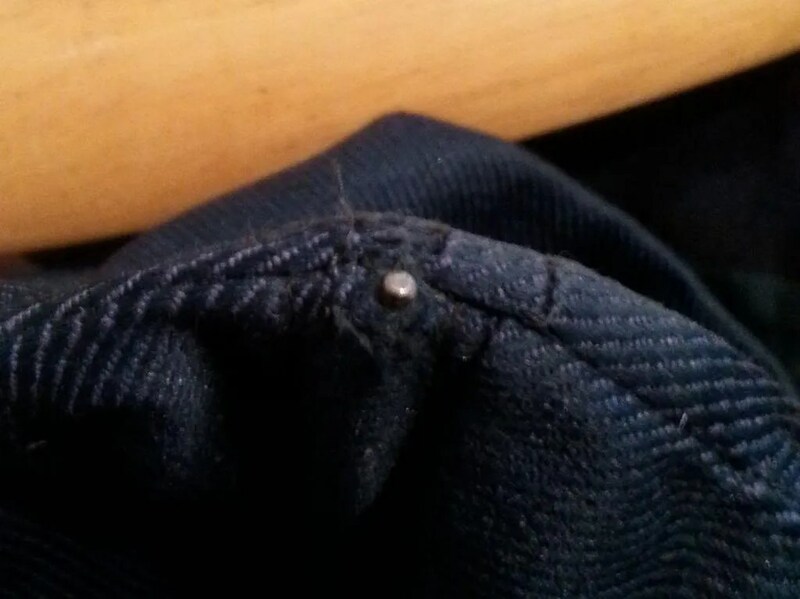 Use this challenge as an opportunity to get your historical wardrobe in order by fixing any little bits that have worn out and gone wrong. For this challenge I worked on 2 different outfits. I first repaired the bodice to my 1530s inspired Scottish Highland Bodice. 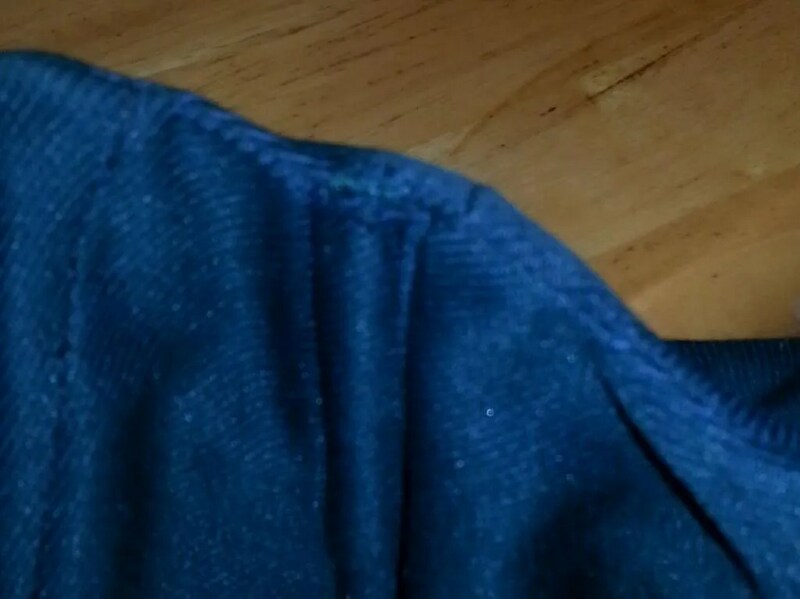 The steel boning on the left side poked through the fabric. The second outfit was my 1300s inspired Crushed Panne Kirtle. I made the bodice as part of my Ren Faire costume when I was on the cast. The time frame of the Faire is during the reign of Henry VIII during his marriage to Catherine Parr. There is very little known of the rural Scottish women’s outfits prior to the 1700s. But it is believed that the outfits were not much different from the merchant class women’s outfits in the cities of Glasgow or Edinburgh. Fabric: A heavy Cotton, like Duck Cloth. Pattern: Based on McCalls 4107. I removed the princess seams and drafted the center pieces and the side pieces as one. Made channels for the boning myself. Notions: Steel rods for boning, Black Cording for lacing. How historically accurate is it? Mostly correct for a mid 1500s Scottish lass. Total cost: Don’t remember. The fabric is from a large bolt I bought for $10. I believe the steel rods were around $5 at Home Depot. Being big chested regular boning that is available at Jo-ann’s doesn’t give me enough support. 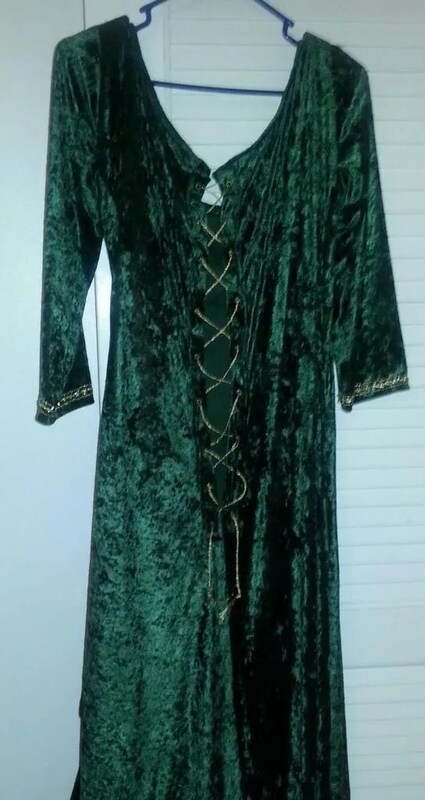 This Kirtle was made in 2007 for a formal work Holiday Party. I’ve always loved the Kirtle and wanted to make one. It needed a panel added to the back because the gold cording would come undone easily showing the world my entire back from bottom to top because I lace it from top to bottom. Panne doesn’t play well with grommets, so I needed to replace a few and reinforce all of them with gold metallic thread. Eventually, I’ll need to take it in, but that can happen another day. 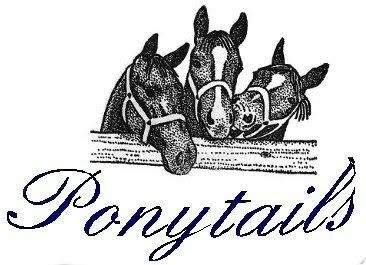 Pattern: Based on McCalls 4990. Removed the zipper and made it a lace up. Notions: Gold colored grommets for lacing. Gold cording for lacing. Gold braid that was stitched around the wrists. 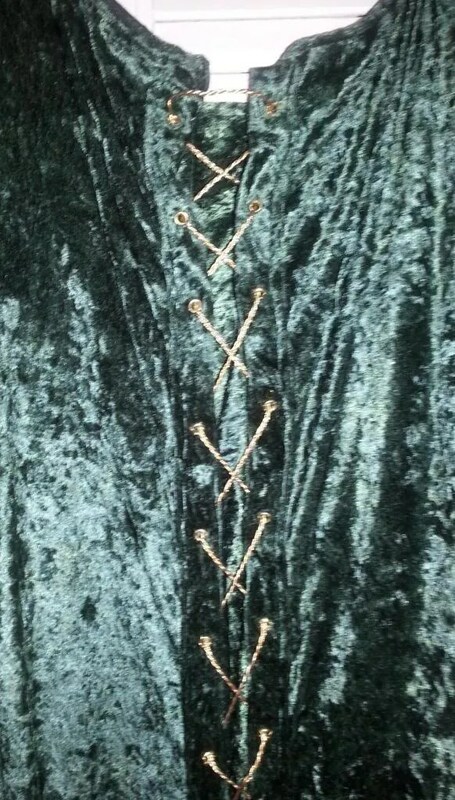 Gold metallic thread to reinforce the grommets. How historically accurate is it? The basic shape of the Kirtle is accurate. The gold accents and fabric choice are probably not. I do not have an overdress for this, which is common for a 1300s Kirtle. Also, there is no head covering. Total cost: Don’t remember. I remember buying the fabric while it was on sale.